Excellence. It’s not a word usually associated with vending machines. At Greensboro Vending & Coffee Company, we’ve changed that. For us, outstanding service and exceptional quality are the bottom line. We stock national brands as well as premium local products. We keep our food fresh, our equipment impeccably clean and our trucks refrigerated. Have an emergency? We will be there within the hour to address it – guaranteed. All employees have U.S. Government Security Clearances which gives you the peace of mind knowing that you can trust each and every one of us. We give you a direct link “to the top”. Our managers and supervisors are always available to talk with you and resolve any problems. From soups and salads to deli-style sandwiches, subs, and sizzling-hot pizza, Greensboro Vending & Coffee Company knows what your employees want but we never stop learning. We will stock the specific foods that your individual staff members enjoy the most. This customer-focused attitude is what drove us to add fruit, yogurt, and other low-fat items to our refrigerated section along with special ice cream promotions, “give away” days, New Age healthy drinks and specialized catering. 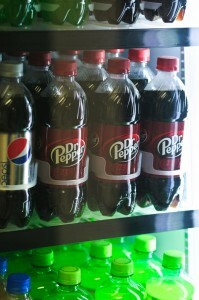 The Greensboro Vending & Coffee Company may not be the only vending company in town but we will do what it takes to be the only vending company in town for you!